For other uses, see Washi (disambiguation). Origami cranes made of washi. Example of making washi at Ise, Mie Prefecture. IseWashi makes washi for Ise Jingū. Washi (和紙) is traditional Japanese paper. The word "washi" comes from wa meaning 'Japanese' and shi meaning 'paper'. The term is used to describe paper that uses local fiber, processed by hand and made in the traditional manner. Washi is made using fibers from the inner bark of the gampi tree, the mitsumata shrub (Edgeworthia chrysantha), or the paper mulberry (kōzo) bush. As a Japanese craft, it is registered as a UNESCO intangible cultural heritage. Washi is generally tougher than ordinary paper made from wood pulp, and is used in many traditional arts. Origami, Shodo, and Ukiyo-e were all produced using washi. Washi was also used to make various everyday goods like clothes, household goods, and toys, as well as vestments and ritual objects for Shinto priests and statues of Buddha. It was even used to make wreaths that were given to winners in the 1998 Winter Paralympics. Several kinds of washi, referred to collectively as Japanese tissue, are used in the conservation and mending of books. Washi is produced in a way similar to that of ordinary paper, but relies heavily on manual methods. It involves a long and intricate process that is often undertaken in the cold weather of winter, as pure, cold running water is essential to the production of washi. Cold inhibits bacteria, preventing the decomposition of the fibres. Cold also makes the fibres contract, producing a crisp feel to the paper. It is traditionally the winter work of farmers, a task that supplemented a farmer's income. Kozo, a type of mulberry, is the most commonly used fiber in making Japanese paper. The kozo branches are boiled and stripped of their outer bark, and then dried. The fibers are then boiled with lye to remove the starch, fat and tannin, and then placed in running water to remove the lye. The fibers are then bleached (either with chemicals or naturally, by placing it in a protected area of a stream) and any remaining impurities in the fibers are picked out by hand. The kozo is laid on a rock or board and beaten. Wet balls of pulp are mixed in a vat with water (and, in some cases, neri, which is a mucilaginous material made from the roots of the tororo aoi plant) and one of two traditional methods of paper making (nagashi-zuki or tame-zuki) is employed. In both methods, pulp is scooped onto a screen and shaken to spread the fibers evenly. Nagashi-zuki (which uses neri in the vat) produces a thinner paper, while tame-zuki (which does not use neri) produces a thicker paper. With enough processing, almost any grass or tree can be made into a washi. Gampi, mitsumata, and paper mulberry are three popular sources. Ganpishi (雁皮紙) – In ancient times, it was called Hishi (斐紙). Ganpishi has a smooth, shiny surface and is used for books and crafts. Kōzogami (楮紙) – Kōzogami is made from paper mulberry and is the most widely made type of washi. It has a toughness closer to cloth than to ordinary paper and does not weaken significantly when treated to be water-resistant. 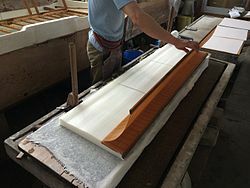 Mitsumatagami (三椏紙) – Mitsumatagami has an ivory-colored, fine surface and is used for shodō as well as printing. It was used to print paper money in Meiji period. ^ Hughes, Sukey (1978). Washi: the world of Japanese paper. Tokyo: Kodansha International. ISBN 0-87011-318-6. Hughes, Sukey (1978). Washi: the World of Japanese paper. Tokyo: Kodansha International. ISBN 0-87011-318-6. Fukushima, Kurio (1991). Handbook on the Art of Washi. All Japan Handmade Washi Association. "Washi". Japanese Architecture and Art Net Users System.